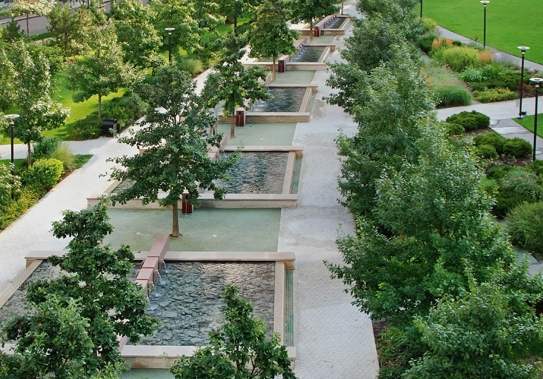 Six acres of serenity in the heart of the city-The magnificent park at Lakeshore East is the centerpiece of the community. This virtual botanic garden designed by world-renowned landscape architect James Burnett together with Chicago’s Site Design Group was officially dedicated to the city of Chicago by Mayor Daley and other city officials on Saturday, July 16, 2005. A blend of stairway terraces, sidewalks, vast green spaces, interactive and aesthetic cascading water elements, and intimate gardens, this oasis in the heart of downtown is rapidly developing a reputation as the biggest and best front yard in the Chicago metropolitan area. At night the park illumination is a light show highlighting the unique navigational patterns of the design of pathways, the grand staircase and the back lit mystical flowing waters. Additional special areas in this botanical gem included on the list of Great Chicago Places and Spaces by the Mayor’s Office of Special Events include a delightful children’s playground, an enclosed dog park and a magnificent open meadow. The surrounds include hundreds of varieties of trees and plants identifiable through The Park at Lakeshore East’s own Botanical Guide.